There’s nothing better than waking up to your own beach! Sailrock Resort’s Beach Front Villa puts you right on the sea, with two private bedrooms and a modern Great Room to relax in. Plus, the resort has absolutely everything you could hope for: a restaurant, spa, water sports, hobie cat, and more. 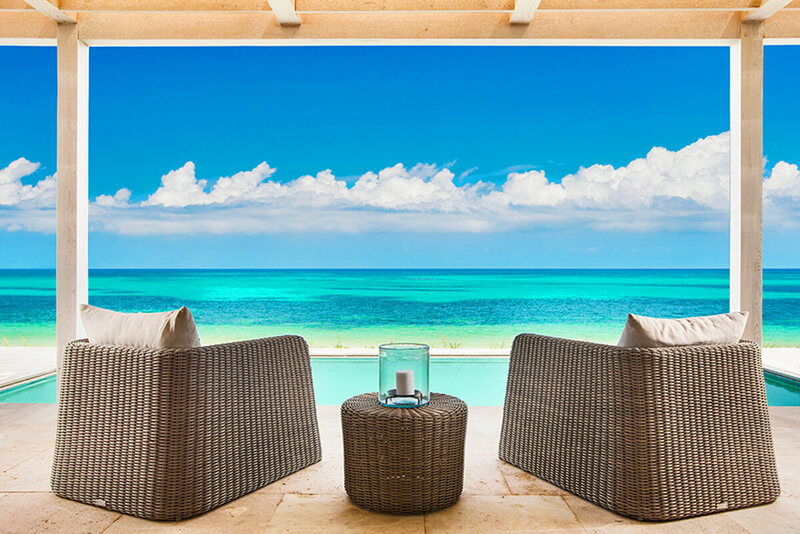 Sailrock Resort Beach Front Villa is a two-bedroom villa with daily housekeeping on South Caicos. This fully air-conditioned vacation rental is perfect for families or couples who want a slice of privacy in paradise. This property has direct beach access and is elevated 25 feet above the sea for maximized ocean views. There’s a temperature-controlled oceanfront pool surrounded by a wooden deck with loungers, a veranda with living areas, and a terrace garden with a breakfast nook. Opposite the Great Room, there’s a dining area surrounded by gardens. Inside, guests can watch movies on the flatscreen TV and dine at the rustic wooden table, all with an ocean view. Vaulted ceilings stretch overhead, and the kitchen sits adjacent with stainless steel appliances, a Keurig, and a breakfast bar. Both bedrooms have a king bed, exterior access, and ensuite bathrooms. The king beds can be made up as two full beds for children. Guests have access to Sailrock’s fitness center and daily housekeeping. Sailrock Resort offers all kinds of experiences, from dining to a spa to water sports. Guests also have access to the resort’s kayaks, snorkeling, paddle boards, bikes, and hobie cats.